Theater Review: A Transitory Journey to the Recent Past in Hillary and ClintonLaurie Metcalf and John Lithgow as the couple we all think we know. Theater Review: The Songwriting and Storytelling Tours de Force of HadestownAncient myths, made absolutely fresh. Theater Review: Men Behaving Bigly, in Burn This and SocratesAdam Driver looks giant up there onstage. Theater Review: Counting One’s Way Through 17 Border CrossingsVisual ingenuity but the sketchlike structure sags. Theater Review: Once More Into the Storm With King LearWith Glenda Jackson as the king. Theater Review: John Doyle Strips The Cradle Will Rock Down to the Bare WoodJohn Doyle applies his tool kit to the 1937 agitprop play. Theater Review: The Loopy, Barbed Office Satire of Do You Feel Anger?An empathy expert comes to a collections firm. Theater Review: Debating What the Constitution Means to MeOur theater critic and Supreme Court correspondent parse the show’s transfer to Broadway. Theater Review: A Julius Caesar That’s All Noble IdeasThe cast is cast. Theater Review: Turning the Crash Into Entertainment With The Lehman TrilogyThe lead-up to the downfall. Theater Review: Ain’t No Mo’ Is a Biting Farce That Takes FlightJordan Cooper’s new play is a suite of comic sketches. Theater Review: A Temptations Bio-Musical and What Coulda BeenAin’t Too Proud: unbeatable songs and not much drama. Theater Review: Suzan-Lori Parks’s White Noise Is Sneakily, Subtly RadicalWith the amazing Daveed Diggs at its center. Theater Review: Can Kiss Me, Kate Survive a 2019 Gaze?Kelli O’Hara is nearly superhuman, and the highs in the show are very high. But you can’t get away from that script. Theater Review: Be More Chill Does High-School Drama With Knowing WickednessA story that casts a realistic eye on the cruelties of youth, and on the way graduating from high school doesn’t mean the end of our insecurities. Review Roundup: At St. Ann’s, The B-Side Gives Voice to Forgotten MenPlus two well-intentioned misses. Theater Review: Surface Tension by the Pool, in Jeremy O. Harris’s “Daddy”Louche life in Beverly Hills. Theater Review: Does Superhero Get Off the Ground?Theater Review: Does Superhero Get Off the Ground? Theater Review: Creepers in Wonderland, in Alice by HeartShe’s late, apparently, for a very important date. Theater Review: Discovery and Rediscovery in By the Way, Meet Vera StarkAn overlooked (imagined) actress stands in for hundreds of lost Hollywood stories. Theater Review: Fiasco Theater’s Lo-fi Reconstruction of Merrily We Roll AlongHow does it happen? Where is the moment? Theater Review: The Tasteful Goodness of Sea Wall and A LifeJake Gyllenhaal and Tom Sturridge do some tear-jerking at the Public. Theater Review: Rage and Love Times 3, in 2 Strindberg Classics and The LightRevivals of Mies Julie and The Dance of Death, plus Loy A. Webb’s new play. Theater Review: A True West That Simmers Instead of Boiling OverA dose of restraint in a play that typically calls for amped-up intensity. Theater Review: Eddie and Dave Tries to Get to What’s RealA deep and gender-flipped dive into Van Halen. Theater Reviews: Northeast Prep and Southern Gothic in Choir Boy and Blue RidgeNew plays from Tarell Alvin McCraney and Abby Rosebrock. Sara Holdren’s 10 Best Theater Productions of 2018New life for old Greeks and Oklahomans and civics-class speechifying. Theater Review: Can a Cooled-Down Network Bring the Heat?Theater Review: Can a Cooled-Down Network Bring the Heat? Theater Review: How Over-the-Top Should The Cher Show Be?Do you believe in life after life? Theater Review: A Soft-Edged Production of Tom Stoppard’s The Hard ProblemTom Stoppard’s first new play in a decade gets a production that’s a little cuddlier than we’re accustomed to. Theater Review: The Minor-Key K-Pop of Wild Goose DreamsHansol Jung’s play gets a fantastic, enveloping production. Theater Review: Raúl Esparza Makes a Hard-to-Resist Arturo UiJohn Doyle’s customarily spare production makes Brecht great (again). Theater Review: Is Will Eno’s Thom Pain (based on nothing) Still Revolutionary?Fourteen years later, it feels out-of-step. Is Mike Birbiglia’s The New One a Broadway Show or Standup? Our Critics Discuss.Sara Holdren and Jesse David Fox compare notes. Theater Review: King Kong, Who’s There?Besides the giant mechanical ape and the 14 puppeteers who keep him going, that is. 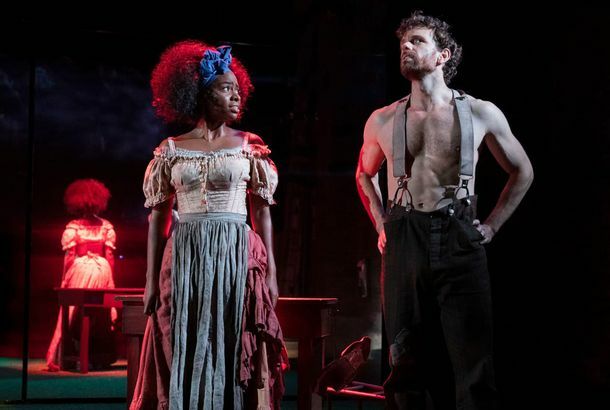 Theater Review: Eve’s Song, Long on Relevance and Short on Dramatic CraftAnother story of good theatrical intentions that don’t hold up a play. Theater Review: The Indignities and Glories of Female Adolescence in Usual GirlsAnd the dangers those girls face. Theater Review: The Thanksgiving Play Is All Stuffing, No HeartAnd it’s a turkey. 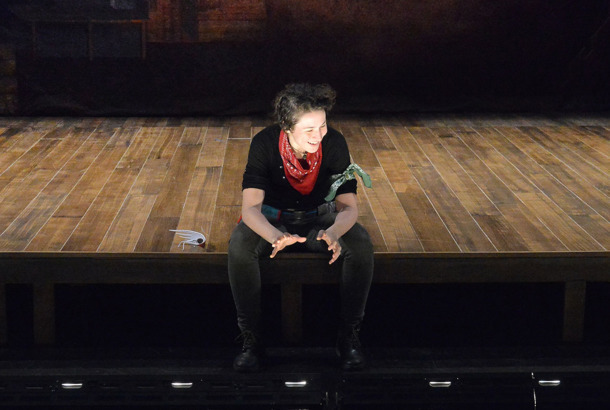 Theater Review: The Good Intentions of American SonGoodhearted does not mean good.